To kick off the summer and celebrate the successful end of 2nd grade x 2 + 4th grade, the boys wanted to go to King's Dominion. We left early and arrived shortly after the park opened for the day. 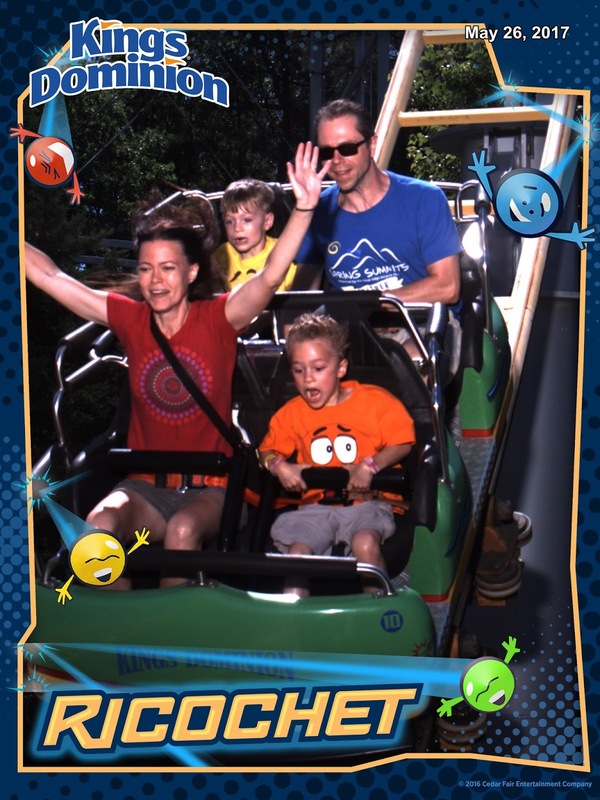 Cort tried to spike up his hair to be taller for some of the scarier rides, but alas, he didn't fool the measurers. He was still able to ride some milder thrill rides, like the Ricochet, the Avalanche and what used to be the Scooby Doo (which was my first roller coaster, when I was about 13). Pierce has been trying to learn French through an app called Duolingo, so he wanted to go up in the Eiffel tower replica. I can no longer ride the super spinny rides like the Scrambler, so Paul took one for the team and rode the Scrambler over and over (it was Pierce's favorite ride). Reid turned out to love the roller coasters. He wasn't tall enough ride the most intense three, but he rode all the ones he could (Cort was so jealous - he just needs to grow that last inch to be able to ride the ones Reid rode!). I had a blast riding the Anaconda with Reid, which goes upside down three times and also goes under water. It came out around the time I had season passes to King's Dominion in high school, so it was kind of like returning to an old friend. Over twenty years later! I couldn't stop smiling. Here is Reid (yellow shirt) getting ready to go on the Grizzly, his last coaster of the day. It was late and by this time there were no lines anymore. Unfortunately, the boys were exhausted, and the drive home involved a lot of bickering. Then we hit a closure on the interstate due to an overturned tractor trailer. So we sat there, exhausted, staring at the sea of headlights in the dark. It was almost 1:00 am by the time we got home! 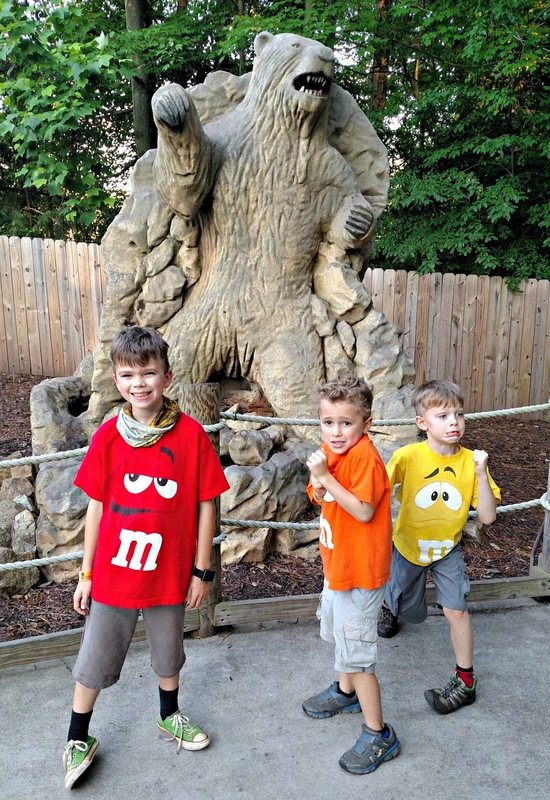 Overall, though, we had a fabulous day, and the boys can't wait to go back, hopefully a little taller next time. 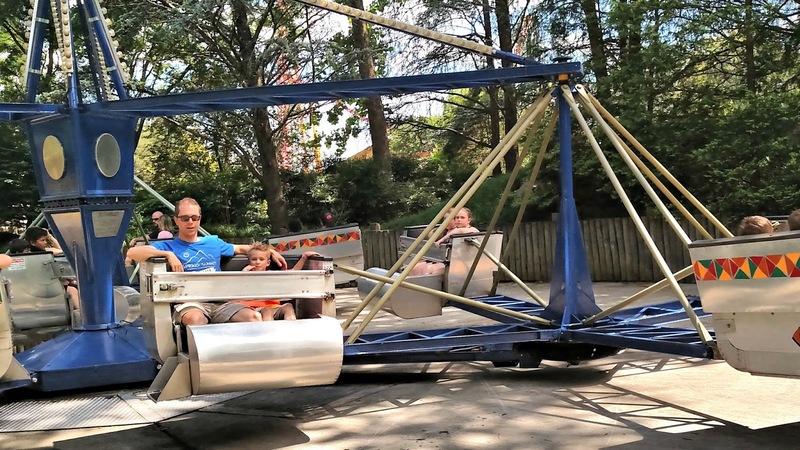 Readers, do you like roller coasters? ...Lisa, what a lovely family, I'm glad that you you have a ball. I used to like them... then not so much. I get nauseous.. bleh! I miss the days of taking my kids to the parks!! Enjoy this age, it goes by way too fast. It looks like you had a great time! Poor Cort--he'll grow, just takes time. I love that you enjoyed the rides so much too. :-) I have never ridden a huge roller coaster. So much fun! Living in the heartland of entertainment world, it would be pretty impossible not to hit an amusement (or theme) park regularly. Our annual Universal Studios passes just expired, and my hubby was trying to convince me we should get Disney passes again. With me 7 months pregnant. So, no, that's not happening. =) Neither are roller coasters. Nope, not really too scary for me! But everyone in my family does, and they ride them! 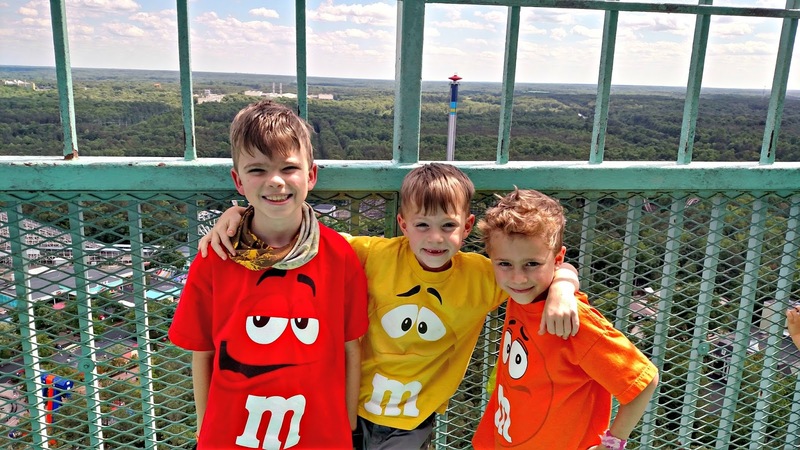 Looks like great fun for all in your photos and I just adore their cool M&M shirts! Sounds like a fun day! I love the photos. Too bad about the traffic on the way home. I have a hard time breathing when riding them. LOL I recently rode a old wooden one.The spinning rides, I would be with you one the sidelines.My kids give me a hard time since I like fast cars and motorcycles. 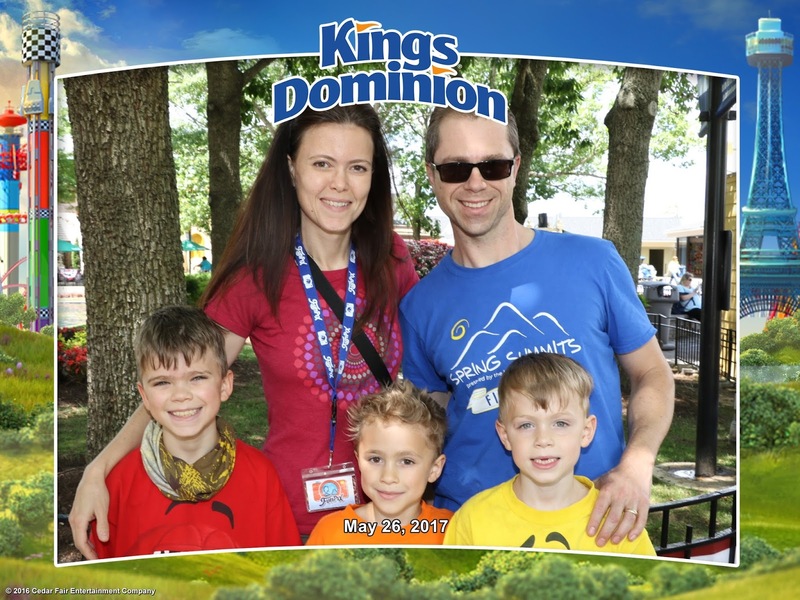 Such great photos of you all enjoying King's Dominion (we used to take our kids there eons ago when we moved south) - glad it was loads of fun. Yes, traffic tie ups can spoil a road trip - thankfully you stayed safe and I know were really glad to get home no matter the late hour! Thanks for sharing your trip, brought back many memories of fun with the children so long ago for us. These pictures are really great!! I love them all. Had the boys been before? A good idea to spike the hair up! They are growing so fast! We took the girls to a carnival last week and I felt so bad for Anne Marie. She didn't like the tame rides she went on with her little sisters. So when it was time for her to ride the big rides, they wouldn't let her go by herself and we could find no one to go with her. So we bought her a basketball. How does Pierce like Duolingo? I have a friend who uses it, and she loves it, and recommends it to everyone who wants to learn a language. Looks like a great family day. I can't do spinny things anymore, either. Even turbulence on an airplane makes me sick! We used to live right down the road from there, I don't like the roller coasters but I think I have been on them at one time or another. You were very close to where Secretariat the horse was born, just past the park as I remember. Bickering and road trips go hand in hand. It's part of the overall experience. ;) I do love rollercoasters. My kids do too. :) Glad you had a nice time! Looks like everyone had a good time. Great picture of the entire family. I have a season pass to Six Flags St. Louis and visit there a few times a year to ride the coasters. I do like roller coasters! Some of the other rides, no. Thanks for sharing the fun! Wow. Getting home at one in the morning would have killed me. I can't do late nights anymore. Kings Dominion rings a bell with me, but I can't remember in what context. I might have gone there at some time or other during the years I was stationed in Quantico, maybe. I had a blast reading this, having been in Cort's predicament. The hair spike was a creative idea! Paul is a good sport. I remember The Scrambler as a favorite too! Wow, it sounds like this amusement park has a lot of roller coasters! Lewie would love it, and since he's already 4' 5", he most likely would get on all of them too. I'm actually pretty scared of roller coasters, so I choose to go on the spinning rides, but one per hour is my limit. Unfortunately, I used to love them as a kid; now my stomach can't tolerate them as much either. So glad you had a great day to kick off summer! What a fun day for your family. Well, fun until the long ride home....yikes. Cute pictures... Love the first Family Picture --and all of the ones with the 3 boys.. Such different personalities--I can tell. I do like them! What a fun post! It looks like you all are having fun! I love play areas like that.